The one award that has a special place in the heart of not only the celebs but common public is undoubtedly the prestigious ‘Filmfare Award’. Every actor, actress, director, music director or singer aspire to hold this ravishing ‘black lady’ at least once in their lifetime. Trust Ranveer Singh when it comes to quirky fashion style! 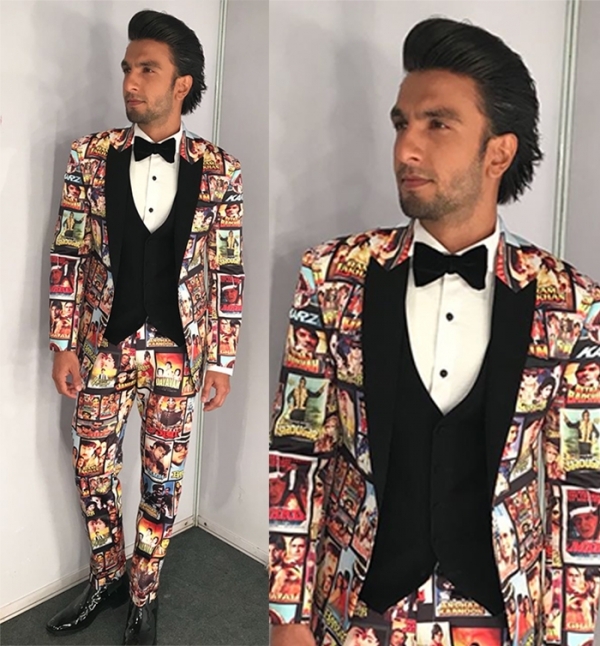 The ‘Padmavat’ actor who is sporting a lean physique for forthcoming ‘Gully Boy’ made flashbulbs go crazy with his funky suit designed by Karrtik Dhingra which has posters of RS’s favourite movies. Ranveer pulled off the suit quite effortlessly! Ranveer bring smile on every media persons’ face with his funny antics. Miss World 2017, elegant Manushi Chillar made a grand entry on stage looking ravishing in little red dress as the superstars, Shah Rukh and Ranveer both vied for her attention. The pageant winner confidently matched steps with Ranveer Singh. 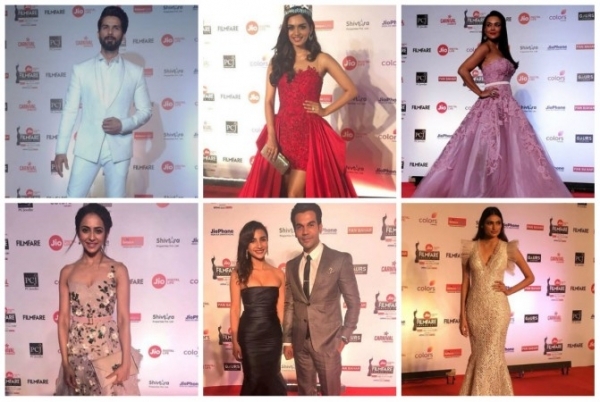 Akshay Kumar and action go hand in hand whenever its possible and 63rd Filmfare Awards 2018 was not an exception. The ‘Khiladi’ entered the stage from 20 feet above the ground suspended by cables. His act was well received by the audience, especially Kumar’s self-proclaimed fan, Ranveer who whistled and hooted for his favourite hero. Akshay not only danced but also sang a Punjabi track. Vidya Balan received her well deserved ‘Best Actress’ Award from another southern beauty, eternal diva Rekha herself. Both ladies, dressed in stunning saris, showcased mutual admiration for each other. 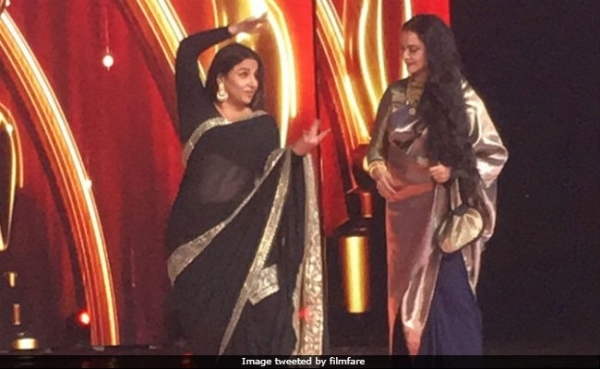 Vidya was visibly excited to receive her second Filmfare award from Rekha after bagging it first in the past for ‘The Dirty Picture’. Vidya confessed her respect for the legendary actress, by admitting that Rekha is her true inspiration. 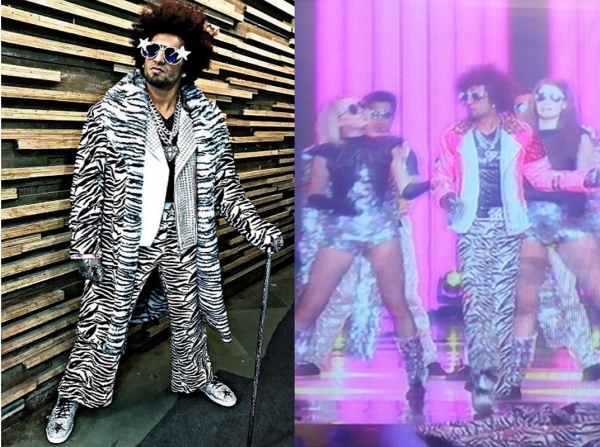 Ranveer danced on famous hits like ‘I am a Disco Dancer’, ‘Yaar Bina Chain Kaha Re’, ‘Tamma Tamma’ and more recent, ‘Tune Mari Entriyaan’ and ‘Ohh La La’, in order to pay tribute to veteran music director, composer and singer Bappi Lahiri who bagged ‘The Life Time Achievement’ award. Bappi Da was fascinated by Ranveer’s lively performance. 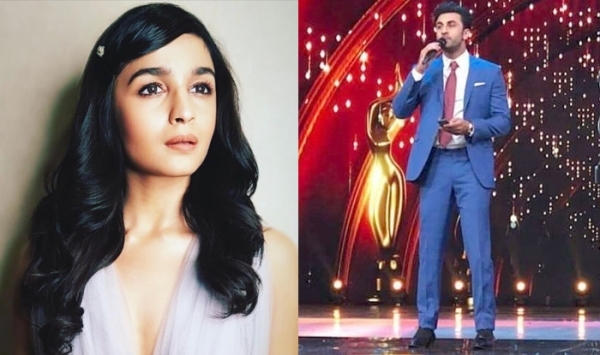 Alia Bhatt made head turn in her delicate Monsoori gown at the 63rd Filmfare Awards 2018. Alia kept it simple with no accessories and natural makeup. While Alia’s ‘Brahmashastra’ co-star, Kapoor scion, Ranbeer stick to formal suit for the award night. The duo together made an interesting pair.